Upland heathland is home, for at least some of the year, to an impressive range of birds including red grouse, short eared owl, merlin, ring ouzel, stonechat, curlew, golden plover, dunlin, and snipe. The distinctive Mountain hare is found here and the streams of the fringes of Upland Heathland can be important for Water Vole. Common Lizard is another inhabitant of upland heathland and adder has been found here although there are no recent records in Barnsley. Invertebrates are especially diverse and include emperor moth, green hairstreak butterfly. Upland heathland was formed by clearance of woodlands on poor acidic soils or where peat is thin, and then maintained over centuries by grazing and fires.. It is dominated by a range of dwarf shrubs, particularly common heather or ling, with bilberry, bell heather and occasional crowberry, western gorse and juniper. In the cloughs, or narrow valleys, which extend into the heather moorlands, a greater mix of dwarf shrubs can be found together with more lichens and mosses. It is often found as part of a mosaic of habitats with blanket bog and rough acid grassland and some scrub, woodland and rock habitats. 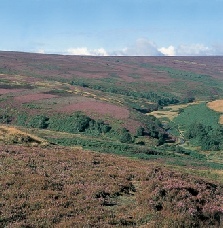 Upland heath, tinting the landscape purple, covers extensive areas of the slopes of the Pennine moors in the west of Barnsley above the enclosed pasture land and the 300 metre contour. Due to the altitude, weather conditions and soils, special communities of flora and fauna are found in the habitat,notably mountain hare and a range of moorland birds. Upland heathland is a local priority habitat because of its national status, the species it supports and the potential for its conservation in Barnsley. It is identified in Phase 1 habitat surveys as dwarf shrub heath. It is found above the 300 metre contour on upland moors. It has dwarf shrubs such as heather or bilberry covering at least 25% of an area of mineral soils or thin peat less than 0.5m deep. Upland heath is dominated strongly by common heather. Bilberry - wavy hair-grass heath H18. The flora and fauna of upland heath is influenced by climate, altitude, aspect, slope, and management practices including grazing and burning. Blanket bog and other mires, grassland, bracken, scrub, trees and woodland, freshwater and rock habitats frequently form intimate mosaics with heathland vegetation in upland situations. This habitat mosaic is important for biodiversity. Dwarf shrubs should be seen as one heathland feature along with other features such as bare ground, grassland, scrub and wetlands. Upland heath in ‘favourable condition’ is generally structurally diverse, containing stands of dwarf shrubs at different stages of growth, including areas of mature heather. It is important to maintain as much structural diversity as possible in order to provide for species with widely differing requirements. An important feature needed is shelter - provided by vegetation or indeed the shape of the land - to reduce wind speeds and create warmer microclimates. Modern management for this habitat is mainly designed to favour Red Grouse with strip burning or flailing. Cloughs are mainly unmanaged and these zones often have a more varied range of species. Birds: Red grouse, Merlin, Ring ouzel,Curlew, Golden plover, Dunlin, and Snipe can be found on Barnsley’s upland heathland. It has the potential for recolonisation by Black grouse, Hen harrier and Twite. Mammal: Mountain Hare is the characteristic mammal of upland heathland in the Dark Peak. Brown hare may be present as well as small mammals, stoat and weasel. Reptiles: Common Lizard, and Adder, although there are no recent records of the latter. Green Hairstreak Butterfly, Emperor Moth. grey mountain carpet moth Entephria caesiata, heath rustic Xestia agathina, northern dart Xestia alpicola subsp. alpina and neglected rustic Xestia castanea). Enclosure and conversion to grassland or planting of woodland. Neglect causes reversion to scrub. Pressures from over-grazing and excessive recreation use. Uncontrolled fires and too frequent ‘controlled’ burning of heather or which covers too large an area, reduces overall biodiversity. Grazing and burning too often leads to reduction in the cover of dwarf shrubs and increasing dominance of mat grass, or purple moor-grass in wetter areas. Bracken and rhododendron invasion in some areas. Fragmentation of quality heathland habitat affecting associated species. Possible threat from infestations of heather beetle due to more frequent mild winters and wet springs. Preventing scrub encroachment and clearing any excessive scrub. Maintaining appropriate grazing whilst avoiding overgrazing. Managing burning with care and preventing uncontrolled fires. Retaining wetter areas and any water bodies. Protecting heathland from change of use and from development. Encouraging people not to disturb ground-nesting birds and not to damage the habitat. Making sure ‘access’ is appropriate. Upland heathland is a priority for nature conservation because it is a threatened habitat. In Barnsley there is 298 ha of upland heath, almost 1% (0.91%) of the district, in 19 sites. It mainly falls within the Peak District National Park. The areas of upland heath in Barnsley are either within sites designated as SSSI or as a Local Wildlife Site. Some of the area is designated as an Environmentally Sensitive Area (ESA). SSSIs have legal protection. Certain operations require consent from Natural England. Natural England promotes managing and bringing SSSIs into favourable condition and monitors such work. LWS have a presumption against development but have no protection against operations that do not require planning consent. Activities on upland heath where protected species are present may involve offences being committed under the Wildlife and Countryside Act, 1981. Protected species include all breeding birds. Licences may be needed from Natural England. Review and seek to maintain the extent of upland heath in Barnsley. Review the condition of upland heathland habitat in Barnsley. Promote positive conservation management practice for areas of upland heathland in order to bring them into favourable condition. Seek the restoration of upland heathland habitat and its extension where not detracting from other habitats such as blanket bog. Ensure that all suitable areas of upland heathland in Barnsley are within designated SSSIs or Local Wildlife Sites. number of upland heath areas in positive conservation management. protection given to upland heath sites through SSSI, LWS or other designations. The Upland Heathland criteria for consideration as a LWS are that the sites are over over 0.25ha and contain ≥25% coverage of one or more of the following dwarf shrubs: Heather, Bell Heather, Cross-leaved Heather, Bilberry, Cowberry, Crowberry, or Gorse spp. (The latter in combination with other dwarf shrubs). Upland heathland in Barnsley is found in the Dark Peak SSSI and Pennine Moors SPA and SAC. The “Barnsley Western Moors” Local Wildlife Site abuts the SSSI and also includes Upland heathland. No other LWS in Barnsley contains Upland heathland. Landowners, including Water Companies, Forestry Commission, private estates, trusts, and individuals: follow best practice in managing their upland heathlands for wildlife; take up opportunities to restore or create heathlands where this does not damage other habitats. 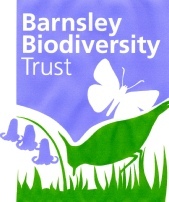 Peak District National Park or Barnsley Council as planning authority: sets conditions in relevant planning applications to ensure that the biodiversity value of heathlands are maintained and enhanced. Natural England:gives advice on heathland management and prevents damage to upland heath in considering applications for change of use. Moors for the Future is a programme active in the Dark Peak. Some heathland that is not part of the open moorland and is just above and around the 300 contour, is considered in this Local Biodiversity Plan as Lowland Heathland and is probably best considered as intermediate between upland and lowland heath. A LWS that contains this intermediate heathland is Brockholes.